You have to admit Germany its clear right to rid itself of its Jews. But one must insist that it happens in a decent manner. -- From an editorial in the Danish newspaper, Jyllands-Posten, on the events of Kristallnacht, 9 Nov 1938. (Cite). 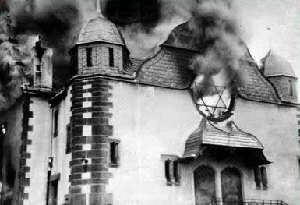 Photo: The synagogue at Siegen, Germany, burning on Kristallnacht, from the BBC's timelime of Nazi genocide.